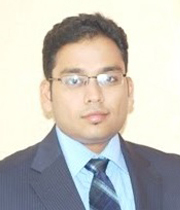 Vivek Ashok Bohara got his PhD in electrical and electronics engineering from Nanyang Technological University, Singapore in 2011. Currently, he is working as an Associate Professor at IIIT-Delhi. His research interests include cognitive radio, cooperative communication and designing digital predistortion algorithms for wideband power amplifiers. During his doctoral research at Nanyang Technological University, Singapore he designed and implemented a prototype WiFi module (IEEE 802.11a) and mobile WiMAX system (IEEE 802.16e) on reconfigurable NI modular instruments as well as on Lyrtech SFF software defined radio platform. For his work on Mobile WiMAX he has awarded 1st prize on 2010 National Instruments ASEAN Virtual Instrumentation application contest. During his tenure as a Post-Doctoral researcher (Marie Curie fellowship) in ESIEE Paris, University Paris-East, he was actively involved in designing and implementing critical blocks for cognitive radio (CR) transmitters. Wireless Communication, Digital Communication and Wireless System Implementation.